If you ever get the chance to visit the sinking yet beautiful city of Venice, you must take a day trip to either Murano or Burano. Both these picturesque islands are a boat ride away from Venice and offer a tranquil oasis. Murano is known for exquisite hand blown glass objects. I visited this island back in 2011 from Venice for a day trip to explore the city and to see how blown glass objects are made. First I visited a blown glass shop where I was able to see in person how these objects are made. So cool! After an awesome experience watching how hand blown glass objects are made, I walked around the adorable city for a bit. La Basilica di Santa Maria e Donato and the Bell Tower. 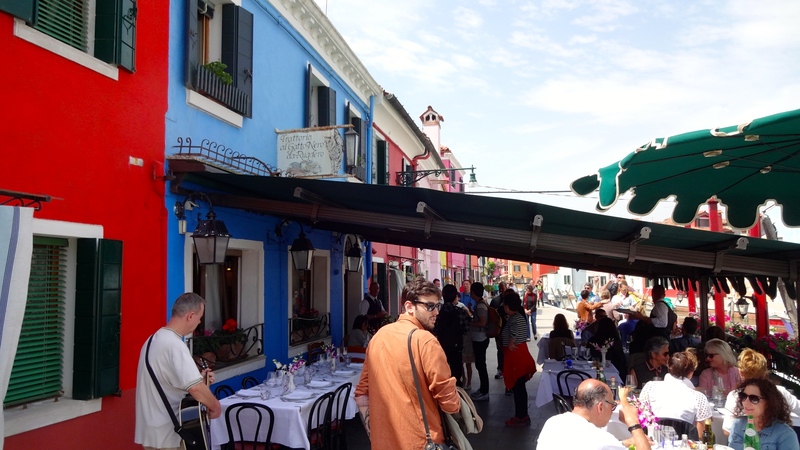 Yesterday Tommaso and I visited the island of Burano from Lido di Jesolo where he’s working for the summer season. This quaint town with multicolored houses and canals truly looks like a dream. On Our Way to Burano. 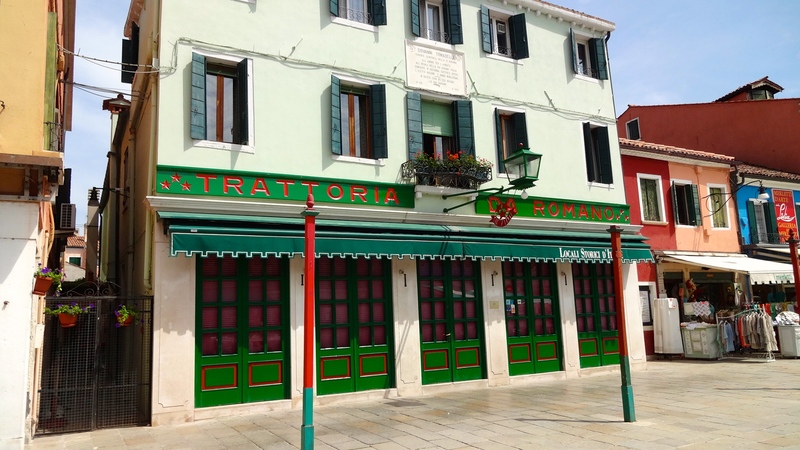 We were eager to eat lunch at Trattoria da Romano to try their famous seafood risotto since it was featured on Anthony Bourdain’s No Reservations but they just so happened to be closed on that day. So disappointing! 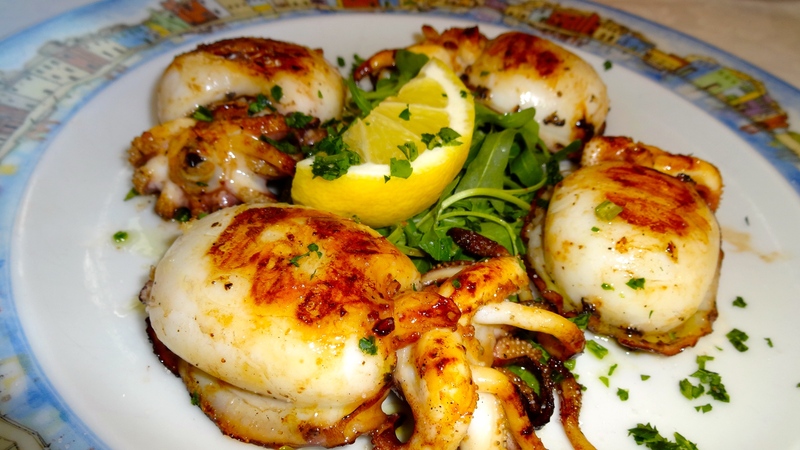 We went to Trattoria al Gatto Nero instead since ratings on TripAdvisor were positive. Outside Trattoria al Gatto Nero. Grilled Cuttlefish with Arugula (7.5/10). Unfortunately the restaurant didn’t live up to the hype for us. First off, service was extremely slow; it took forever to get our appetizer and pasta dish. Our mixed appetizer was nothing special and overpriced for what we received. 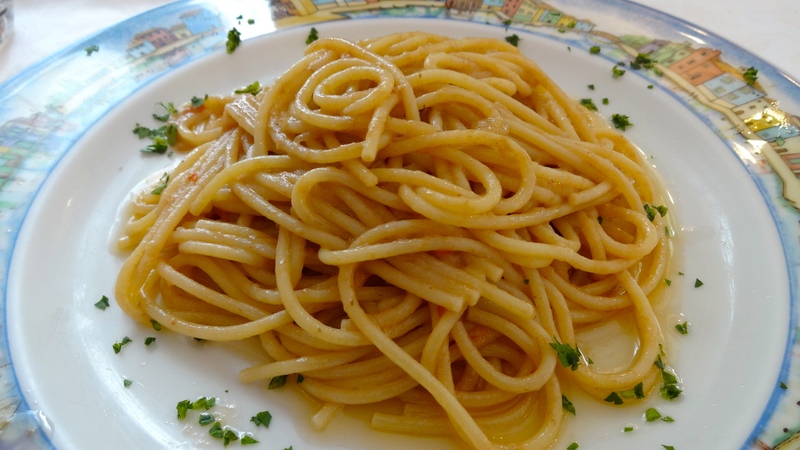 The bigoli in salsa, a classic pasta dish of thick spaghetti type noodles tossed in an onion and anchovy sauce, was overly oily but had a decent flavor. 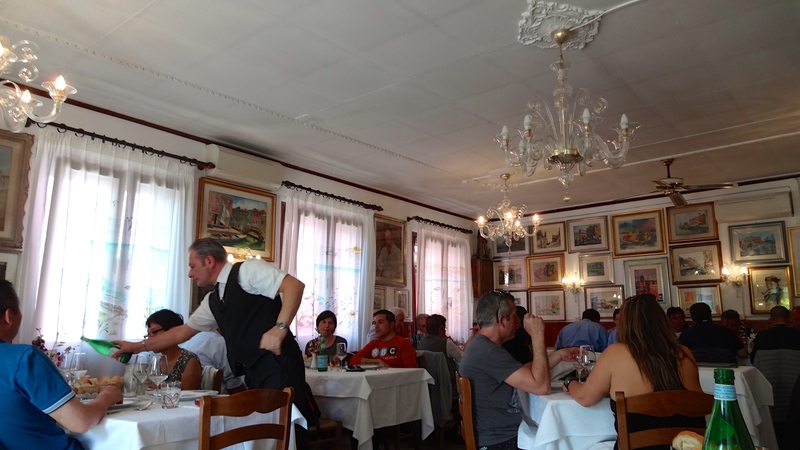 However, I preferred the version at Osteria Oliva Nera in Venice (read my review here). The grilled cuttlefish was by far the best dish of the meal; tender cuttlefish with a nice char dressed simply with fruity olive oil and fresh lemon juice with peppery arugula. Perhaps Trattoria al Gatto Nero had a bad day but I would recommend going to Trattoria da Romano if you have the chance! Overall, my rating is a 5.5/10. 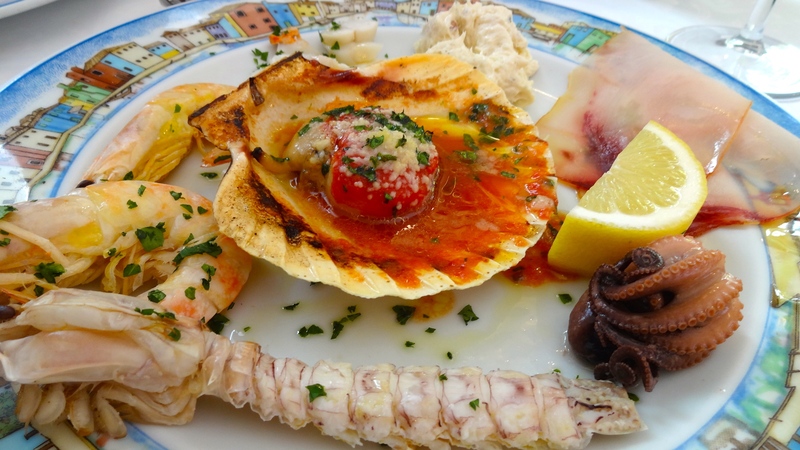 Murano and Burano are both places worth visiting for a calm afternoon strolling the beautiful colorful streets and enjoying some delicious typical Venetian dishes.